It’s an easy thing to get caught up in the idea that civility is basically cerebral. But as the past week has shown, its emotional reality is vitally important, too. About a week ago, on January 5th, in a speech in which he announced some executive orders regarding gun control, President Obama shed very public tears as he spoke about the 2012 mass shooting at Sandy Hook Elementary School in Connecticut. Our unalienable right to life, and liberty, and the pursuit of happiness, he said, with a crescendo of emotion, was stripped from first-graders in Newtown. First-graders. And from every family who never imagined that their loved one would be taken from our lives by a bullet from a gun. And then, wiping tears from his eyes, he told us: every time I think about those kids it gets me mad. “But, a very brave lady,” Boehner added, choking up. Progressives, over the years, have made fun of John Boehner’s publicly emotional style, producing lists of instances of tearful moments, or turning his quivering lip into online memes. And similarly, some conservative pundits this week called into question Obama’s sincerity, wondering – among other things – if he had a raw onion hidden behind his podium. Actor James Woods, on Twitter, suggested that the President’s were #CrocadileTears. But the fact is that tears are powerful, and it behooves us to take them seriously. As Leonard Pitts Jr. of The Miami Herald says of President Obama’s speech: one grows used to thinking of politics as a craft practiced mostly by people who are only technically human – who are automatons programmed to court votes by any means, including cynical ones. But that’s not the reality. This moment destroyed that perception, he writes. The president wept and it was a starkly human thing. Institute President and co-founder Cassandra Dahnke has made a similar observation. Tears show us that our public figures are more than politicians or lawmakers or position holders, she responded when asked about the significance of the President’s emotional moment. They are people – and while they are in unique positions, they aren’t any different from the rest of the us. And that sameness is significant. That sameness highlights one of the core emotional realities necessary to have civility at all: empathy. Tears and other expressions of emotion are outward signs of internal connection. They are part of an economy of emotions that we all – at our best – share between us: the idea that my happiness depends on yours, and that when you suffer, I cannot help but suffer, too. We often think of this sort of empathy as a feature of art and drama, but it is also the basis of our ability to engage in inclusive politics. Empathy allows us to respect others and make room for their feelings and needs – to make our footprint smaller so they can have space, too. When President sheds tears for the victims of the Sandy Hook school shooting, he acknowledges that in some measure the pain of those deaths – the families’ grief and loss – is his pain, grief, and loss. And that connection opens the possibility of acknowledging and balancing conflicting needs. In the speech, President Obama plainly states: I believe in the Second Amendment. He supports the right to bear arms. But empathy informs an acknowledgment that even where rights are concerned, there is no such thing as absolute good. He tells us this with words when he says that we all believe in the First Amendment … but we accept that you can’t yell “fire” in a theater. And he tells us again with his actions – when he cries. Does this mean that his tears are a calculated political ploy, as folks like James Woods have suggested? No. But as John Boehner can surely attest, emotional displays need not be calculated to be rhetorically and politically significant. In both cases – the President’s and the former Speaker of the House’s – tears get to the very personal layer that underlies our politics, the reason we have a political process at all. The fact that I have needs and beliefs that require acknowledgment and respect is basically emotional. And via empathy, my ability to accommodate the needs and beliefs of others is basically emotional, too. So what we see when our elected officials shed tears amounts to a peek behind the curtain. In tears, their most human selves break through. And in these moments of humanity is the potential for a more civil politics: one that understands that our well-being is interconnected, and that negotiates public policy accordingly. It’s difficult to talk about the issue of civility in relation to our national debate about gun violence. Acts of violence like the one we saw today on the campus of Northern Arizona University, or the one we saw last week at Oregon’s Umpqua Community College, are of course inherently, profoundly the opposite of civil. In the course of one person’s cry for attention, such heinous acts silence the voices of others, rend communities, and eliminate the possibility of a productive solution to whatever kind of problem – or perceived problem – precipitated the violence to begin with. But beyond the event itself, our discussions of such tragedies seem to push civility away to the margins. Folks in favor of changes to gun laws hear protests that we need to respect the rights of gun owners as an endorsement of mass violence. While defenders of gun rights indulge the slippery-slope fallacy that any curb on where and how guns may be used is the first step toward an outright ban. Part of this incivility can be put down to the adversarial nature of the campaign process in which Americans are now so thoroughly engaged. The polarization of presidential primaries means that when candidate Ben Carson told ABC News that were he in Oregon, he would ask everybody to attack the gunman because he can only shoot one of us at a time, he took the extreme position he believed he needed in order to appease his base. And when The Daily Show’s Trevor Noah responded, I think he’s overestimating how inspiring his presence might be, he went the ad hominem route he believed would make his audience laugh. The problem, though, is that this kind of polarized response doesn’t just happen in front of the cameras. On Twitter, gun proponents who are surely otherwise civil people mix personal attacks with hyperbole, contributing to the transformation of a conversation into a shouting match. If the gun control movement actually, really wants to change America’s gun culture, they will have to put the least reasonable and the least accommodating activists they can find in charge of directing the entire movement. It’s understandable that a debate about gun violence – especially – might move people to these sorts of extremes. 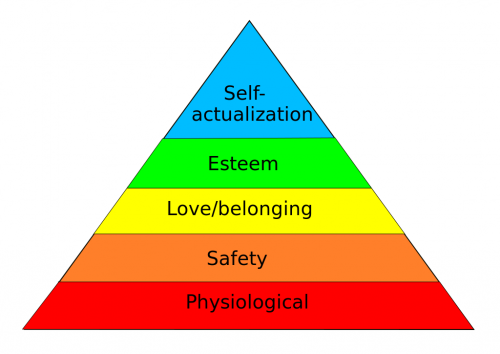 If we consider psychologist Abraham Maslow’s theory of a hierarchy of human needs for a moment, “personal safety” is more fundamental than “esteem,” which is where we might reasonably imagine civility falls. We can contest the accuracy of Maslow’s hierarchy. We can say – as many researchers have done since he first published his schema – that human necessities are not so strictly segregated as he suggests and that we can in fact seek self-actualization and physiological necessities at the same time. But in this case, his pyramid is telling and it illuminates a very real problem. In order to achieve a measure of safety where guns are concerned, we must be able to hold a civil debate. But it is difficult to have a civil debate until all sides in the discussion feel that they have achieved safety. This is a paradox, but it is not an insurmountable one. And for our own sake and the sake of our neighbors, it is a paradox that we absolutely must surmount. The fact of the matter is that almost no gun rights advocate is comfortable with the idea that there have been – conservatively – 341 deaths in high-profile mass shootings since the year 2000. And the fact is that it is only a very few gun control advocates who believe it is either possible or advisable to part Americans from their guns entirely. 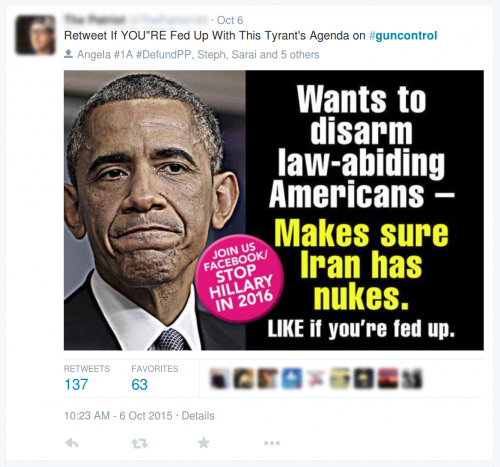 So when President Obama tells us, as he did in his comments about the Oregon shootings, that we must reconsider the notion… that our freedom and our Constitution prohibits any modest regulation of how we use a deadly weapon, we should take him at his word that he is not in fact out to ban all guns. And when a gun advocate like Representative Trent Franks says that he believes gun-free zones are magnets for shooters who deliberately choose a place where they know no one can defend themselves, we should take him at his word, too, that he is earnestly trying to advocate for a solution he thinks is right. As much as anything, a debate about the place of guns in the future of American society has to begin with a modicum of trust that all sides of the issue are coming to the table with positions that they hold in good faith. Because it is only through that trust that civility can prevail, and it is only with civility that we can engage in the very serious discussion of this topic that we so desperately need.